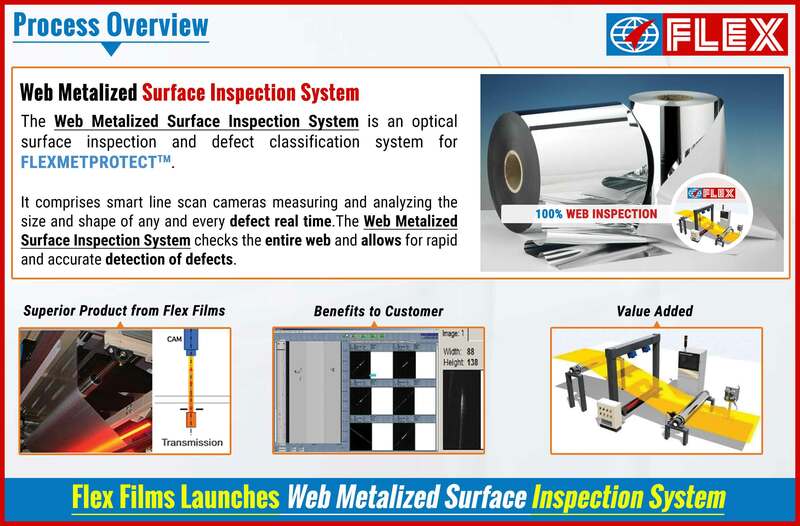 FLEXMETPROTECT TM is now placed under state of the art optical surface inspection technology and defect classification system that reveals and quantifies defects with the help of the newly launched Web Metalized Surface Inspection System. The system checks the entire web and allows for rapid and accurate detection of defects on the film. The Web Metalized Surface Inspection System is located in a strategic part of the slitting process just near to the winding roll comprised of smart, line-scan cameras that can analyze 100% of the web for defects in real time. Speaking about the value offer of the new system, Mr. Anantshree Chaturvedi, Vice Chairman and CEO, Flex Films International said, “This state of the art Web Inspection System helps to evaluate the entire web surface of FLEXMETPROTECT TM generating a superior quality material that will give peace of mind to the customer and has the possibility to be used on AlOx coated transparent film too and we are in the process of acquiring new system to characterize bare film and we assure the quality of our product as always to our customers.